Replies: 2 (Who? ), Viewed: 3968 times. #1 12th Nov 2011 at 6:47 PM Last edited by Krabaten59 : 1st Dec 2011 at 6:33 PM. I have this problem: I meshed this candle as seen in the pic and did some recols also. Thing is, the recols leaves white areas on the texture in the game. Shows up normally in SimPE though. I've ploughed through the threads here at MTS but found no solution. I can't for the life of me figure out what's wrong.As far as I can see the mesh and recolours look ok. But I'd appreciate it if someone would take a look at it for me. I can't show a picture of the recol problem because it dissapears on close up pics and doesn't really show well on the pics seen at a bit of a distance, because the snapshot are not good enough. But if you see it in game it's obvious. Iv'e attached my mesh file and the recolours for download. P.S. 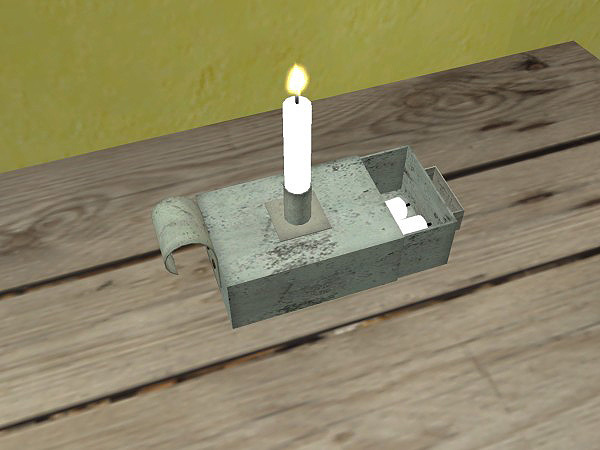 Just remembered: I think I forgot to set the bounding mesh to the candle base, so the object might only be clickable at the flame right now. Sorry for that! Did you remember to "update all sizes" you applied the recolor textures? If you didn't, this may be why the colors change as you pan away from the object. #3 12th Nov 2011 at 9:36 PM Last edited by Krabaten59 : 13th Nov 2011 at 7:02 PM. Edit: anyways...I got some help elsewhere. Turns out that it won't do to have a white background on the texture files. It never occurred to me that would be a problem, but now I know. Hereby sharing the info.